Photograph courtesy of Edward Kimmel at Wikimedia Commons. I recently watched “The Lorax” again from an adult perspective and I found that it’s more than just a movie about a squishy little creature saving trees. For those of you who are not familiar with the 1971 book or the adaption of the story in the 2012 animated movie, “The Lorax” is about the Once-ler who tells a boy from a nearby town about a spunky creature named the Lorax who stands up for the environment. The Once-ler then encourages the boy to convince people to care about the environment and save his town from a greedy businessman. The movie is sweet, funny and evidently quite quotable. Cynics would say it’s far too idealistic. Capitalists would say that it unfairly criticizes industry. Environmentalists would say it portrayed their agenda quite well to the youngest members of society. But despite the differences of these groups of people, they all had one thing in common: they all had an opinion about the issue. Whether or not their opinion is right by any standard is irrelevant. Having an opinion means caring about an issue. And as long as you care, that issue is still relevant enough to incite change. While the environmental stance of this movie was commendable and inspirational, I think the real message is that indifference is what stagnates and degrades quality of life, not necessarily hate. Indifference is cold. It’s the distant cousin that refuses to come to family gatherings. It’s the blunt rejection letter from a college that does not care who you are as a person. It’s the feeling of being overlooked, so insignificant that not even a single thought could be spared thinking about you. It’s what causes all the issues in the world. 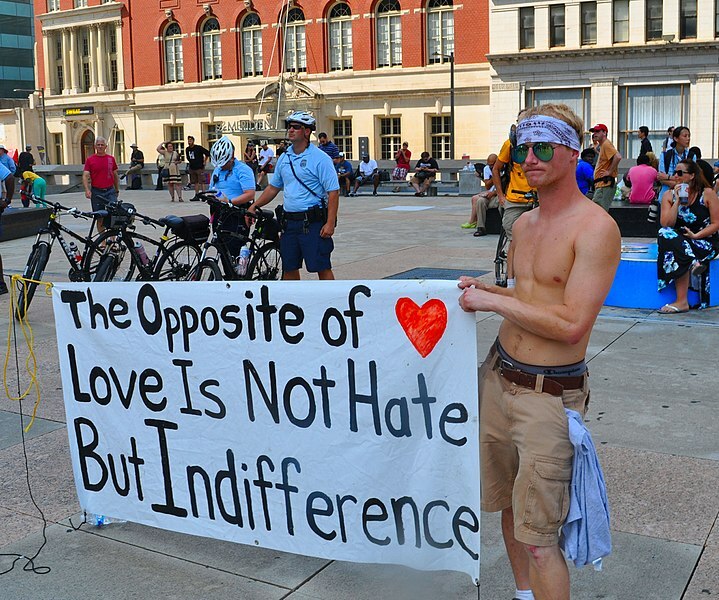 The only antidote to the disease that is indifference is empathy. To be empathetic means to put yourself in someone else’s position, to feel their feelings as your own. It means caring about LGBTQ issues even if you’re not a part of the community; supporting women’s rights movements despite being a man; grieving for the kids in school shootings despite the fact that your kids are safe at home. I’m not saying that everyone needs to care about every issue. That would be overload — people have only a certain capacity to care about things. Otherwise we would go crazy. But it should be recognized that having opinions about issues is the only way to create any change in the world. Whether you’re liberal or conservative, democrat or republican, anti-establishment or completely conformist, have an opinion about something. Care about something.